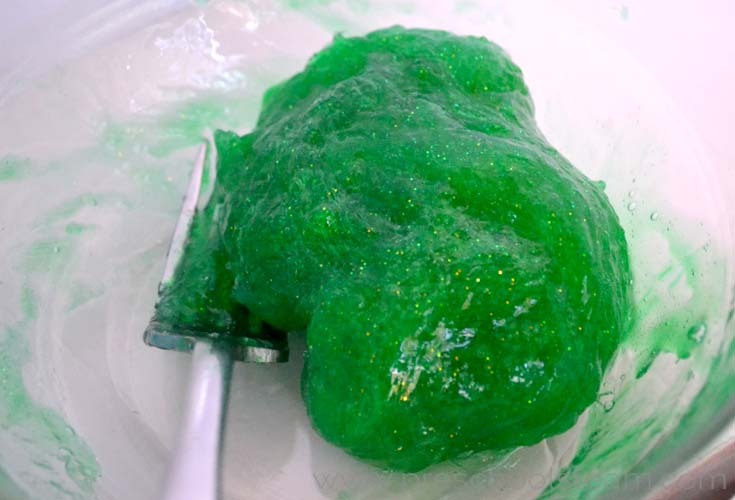 Ever since making our Easy Christmas Sparkle slime we have been on a slime kick! 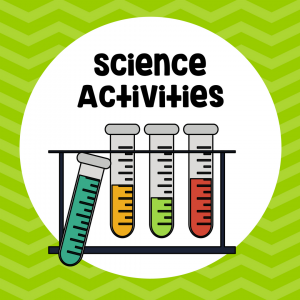 This hands-on slime activity will have you observing the effects of gravity along with developing fine motor skills making it perfect for your young STEM learners and creative problem solvers. 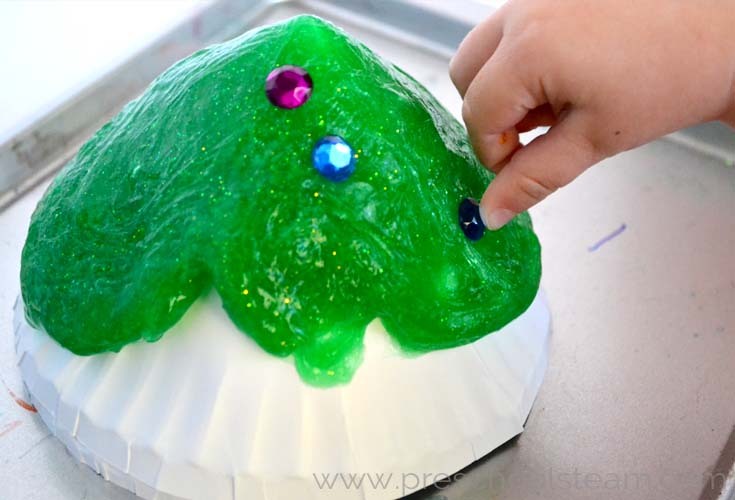 STEM Challenge: Can you use slime to make a Christmas tree? Part 1: Create your tree base. Ask: What shapes are Christmas trees? How can we turn a paper plate into a tree shape? 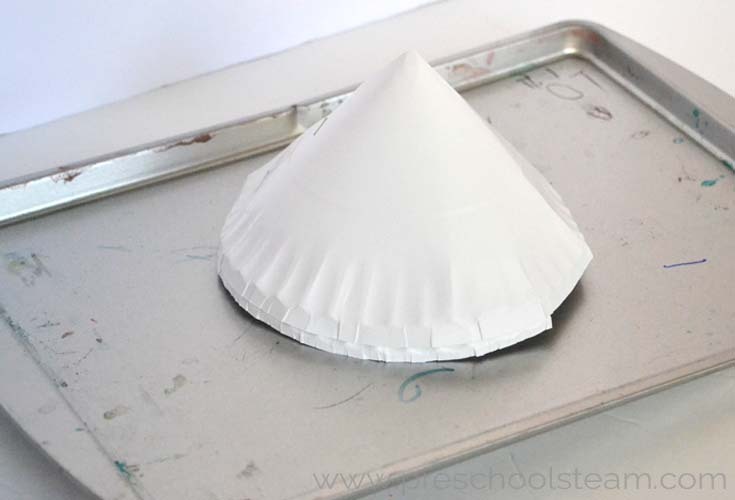 Experiment: Try turning a paper plate into a cone shape. We created a cone shape by cutting a slit from one edge of the paper plate to the center. We wrapped the paper plate around to create a cone shape and secured it with staples. ***Be sure the coated side of the paper plate is on the outside. In our experimenting, you could peel off the slime off a coated side of a paper plate but it did stick if you used a regular paper plate. 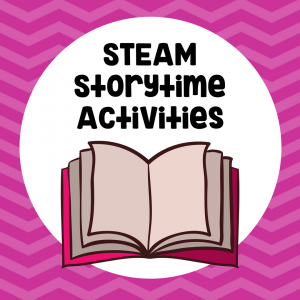 Part 2: Make your slime. 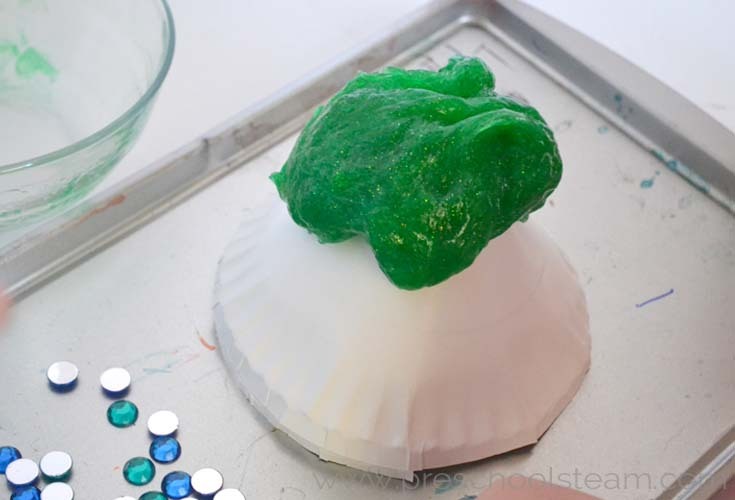 Follow our Sparkle Slime Recipe. We used green food coloring instead of red to represent a Christmas tree. 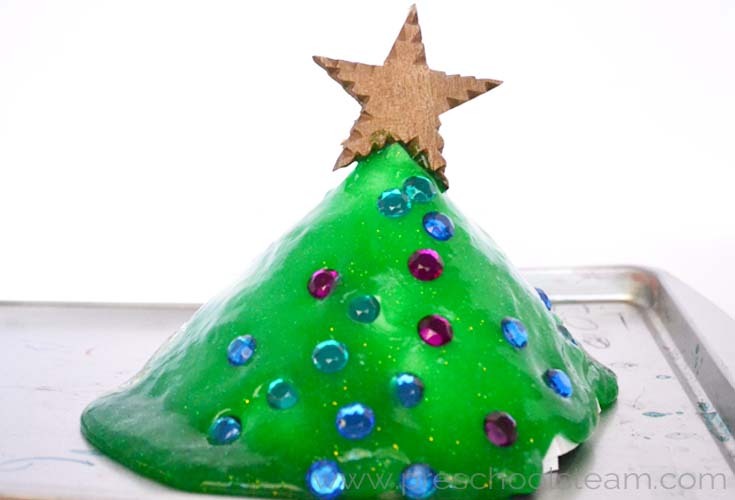 Part 3: Create your slime Christmas tree? Ask: How can we cover the cone in slime? What happens if we place the slime at the top of the cone? What do you think (predict) will happen? Observe how the slime slides down the cone. What do you think is pulling the slime down the cone? Introduce the concept of gravity. What goes up must come down! Step 3: Decorate your tree! 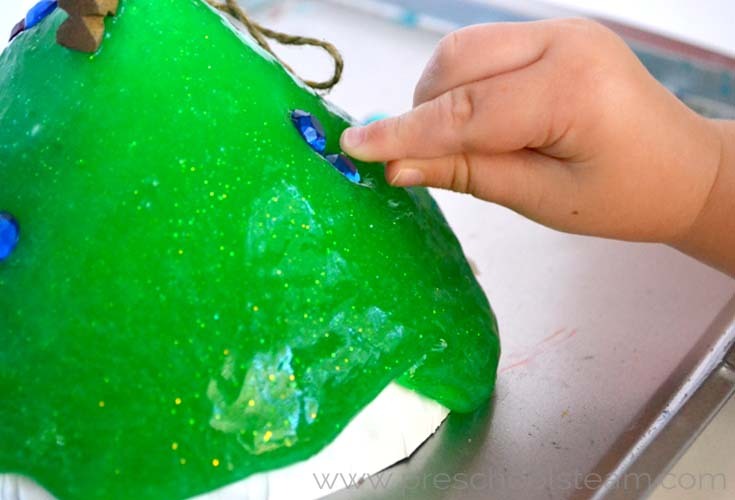 Play: Use those fine motor skills to pick up and place different plastic jewels in the slime to decorate your tree. Additional STEM Challenge: Can you balance a star on top? We used an old star ornament to see if we could balance it on top. It took some practice but then we were able to balance it. 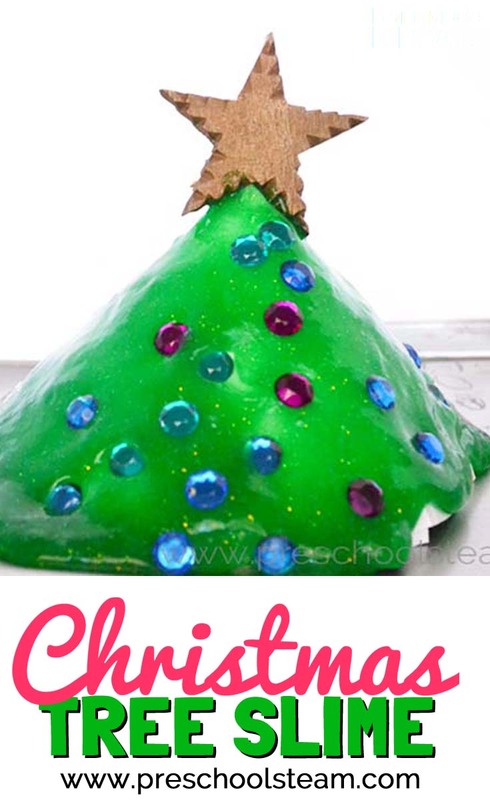 Science: Observe and watch gravity pull the slime over the paper plate cone to create your Christmas tree. Technology: Use a timer or watch to keep track of how long it takes for the slime to cover your entire tree. Engineering: How can you turn a paper plate into a cone shape? 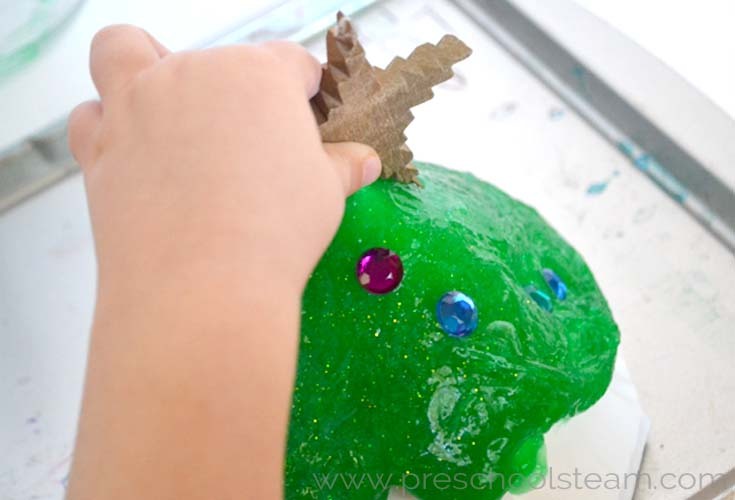 Art: Can you create a decorative pattern with the jewels on your slime tree? Math: Count how many jewels you placed on your slime tree. Literacy Connection: A Wish to Be a Christmas Tree By Colleen Monroe and illustrated by Michael Glenn Monroe.